Welfare. We provide a secure and pleasant environment. Children ideally move on when they are developmentally ready. Thought and care is taken with transition between the groups: BUNNIES, HEDGEHOGS, BADGERS AND OWLS. Short regular visits are made prior to starting in a new area of the nursery, and children begin to build a bond with their new Key Person. It is sometimes possible for children to transfer in pairs. There is a good scope for continued contact between staff and children. Although there are virtually self contained areas within the main rooms for the varying age groups, the nursery is generally envisaged as a whole, creating flexibility and integration between areas, shared staff and resources. We also encourage siblings to have regular contact with one another. There is a full Transitions Policy available to parents in our Policy and Procedures Folder. Each room has their own routine and plan of activities which are displayed for parents. There is provision for all children to rest during the day. Sleeping arrangements are always discussed with parents. 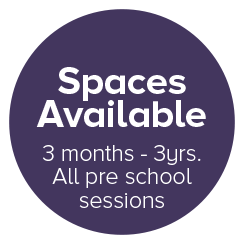 For babies under approximately 18 months cots and a separate sleep room is provided. Older children sleep on mats and have a sleep according to their needs. Older children who do require a daytime sleep have a quiet time appropriate to their needs. We provide bedding for each child. We have been awarded 5 stars by environmental Health for food safety, the top mark that can be awarded. The Nursery has a large kitchen where our food is freshly prepared by our experienced cook. Our menus are produced with the child’s balanced diet in mind, and therefore each meal is prepared using fresh ingredients. Meat, Fruit and Vegetables are delivered fresh on a regular basis. WE DO NOT USE NUTS IN THE NURSERY. Nutritious and well balanced meals are provided throughout the day. Breakfast is available until 9.00am. A mid morning healthy snack with milk or water is provided at 10.00am. A home cooked 2 course lunch is served at 12.00pm. Staff are encouraged to eat with the children. Either a hot or cold tea is provided at 3.30pm, followed by fresh fruit or yoghurt. We offer water or milk for the children to drink and drinking water is always available. Staff are asked to encourage children to relax whilst eating and to respect children’s individual speed of eating. Children are encouraged to enjoy meal times as social occasions, using good table manners and sensible behaviour. In Owls, the children participate in helping to lay the table and serve their friends. Allergies and specific dietary requirements can be catered for if previously discussed with the Nursery Manager/Deputy Manager. Young babies have a diet appropriate to their specific needs which contains no salt, sugar or unnecessary additives. We offer various menus depending on the age and stage of the individual child. Copies of our menus for babies and older children are displayed. Parents also receive copies of these when joining the nursery. Our Nutritional Policy is displayed in the Entrance Hall.